I wanted to share with you a great bookmark a fellow teacher (Eric Bacon) shared with me. The one side has the scripture study skills listed on pages 20-23 of the Gospel Teaching & Learning handbook that you all should have. 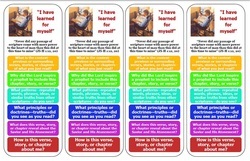 The other side is questions a student could use as they approach a set of verses. This is a great time of year to help your students keep sharp on their scripture study skills. To use it in class, I would go through the bookmark (giving them each a copy) and then give the class a juicy set of verses from the lesson, and have them go through the verses using the skills and then have them be ready to share things they found and have them also share what skills they used. You could also divide up the whole lesson block for the day and give it to different students to do the same thing. This would take you through the whole lesson for the day. The tab on the top of the site called “Seminary Resources” also has 6 different lessons to sharpen scripture study skills and can be used with most any scripture block you have for the day. They are just over half way down on that page.